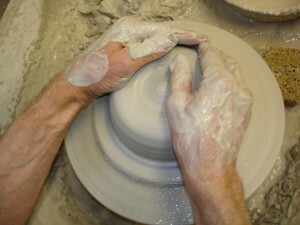 Alan offers personal, one–to–one, Pottery tuition at his studio near Clifden in Connemara, Ireland. Tuition may be an hour or two’s introduction and hands-on feel for clay, up to a 1, 2 or 3 days, or even a 5-day course for the serious would-be potter. Morning or afternoon sessions include refreshments and full-days include a light lunch. Alan’s studio is located only 2 kms from Clifden town, the “capital” of Connemara. Normally only one or two persons are taken on tuition due to space restrictions. 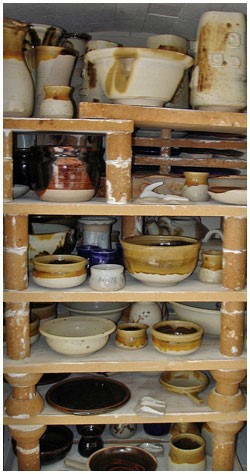 Alan’s tuition is suitable for beginners and those with some experience who wish to learn or brush-up on the techniques of making high-fired stoneware. For those who wish to learn about throwing above all other techniques it would be beneficial if they already have some throwing practice, for example at evening classes.